9/1: Bison Block Party at Scheels in Fargo! 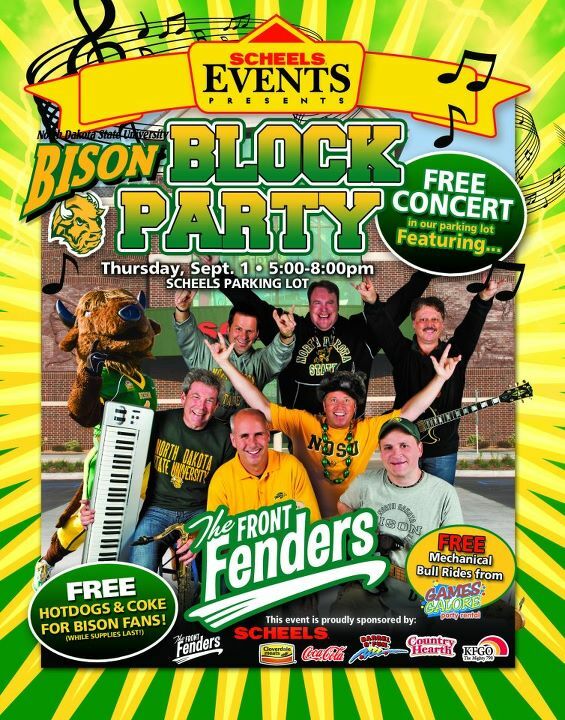 Head out tomorrow night, Thursday 9/1 for a Bison Block Party in the Scheel's Fargo parking lot! There will be a live band, free food and more! AT&T: Possible FREE 1000 Rollover Minutes! AT&T customers can text YES to 11113020 for a possible 1,000 free rollover minutes! Apparently it may not be available to all customers, but I'd say it's worth a shot, as it is a legitimate offer. If you have questions, call customer service or ask over on the AT&T Facebook page. Head over to the Hy Vee Facebook page to print a $2/1 Old Orchard Naturals coupon! This will easily score us FREE juice if you wait for a sale! As you know, milk coupons are extremely rare! Hurry over to print a Tru Moo Milk coupon! 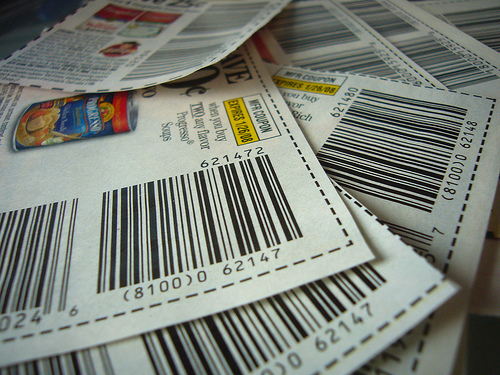 Depending on zip code, people are reporting either a $0.35 or a $0.55 printable coupon! I'm not connected to a printer at the moment, leave a comment telling us what value you get! 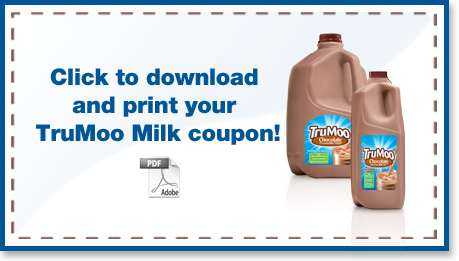 Tru Moo Milk is on sale through today at Hornbacher's for $2.50/half gallon! Because milk coupons are so rare, I thought I'd remind you that we also have a $1/2 Kemps Gallons coupon from the 8/21 Smart Source insert! Final price: as low as $2.25 each! 6 Ears Sweet Corn FREE with $30 purchase and Cash Wise in store coupon! On The Vine Tomatoes $0.98/lb! Plus, look for boxes to purchase that qualify for the Kellogg's Cars rebate! Use the $0.75 printable (use zip code 90210 - will double to $1) Thanks, Krystyne! Cash Wise Hamburger or Hot Dog Buns, 8 ct $0.88! Final price: as low as $1.65! Final price: as low as $1.24! Final price: as low as $2! A great price with no coupon! New Leeann Chin BOGO Coupon! Now that we have a Leeann Chin in the our area (in the West Acres Mall Food Court), I'm excited to share this coupon with you! Head to the Leeann Chin Facebook page to print a Buy One Entree, Get One FREE coupon good through 9/11/11! 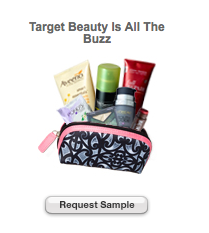 Request a FREE Target Beauty Bag! The last time these were available, they were full of coupons and samples! There is a FREE Sample of Poise Hourglass Pads available from Target as well! As I mentioned on Facebook last night, we cleaned out the fridge last night and were shocked by the amount of food that we waste when things are shoved to the back, or ingredients have gone bad because we didn't plan the meal. I'm determined to make changes in these habits, and I know that one of the best ways to make the most of what you have is to make a meal plan. I've never been terribly motivated to plan our meals out each and every week, but I do notice a change in the mood of our home between 4:30 and 5:30 when I do. I also notice a marked decrease in eating out, unplanned grocery purchases and the general lack of the feeling of "what's for dinner?" Plus, you spend less if you use what you have on hand! That's one of the reasons why I stock up when I can get chicken for $0.50/lb, and pasta for $0.20. This month, a week at a time I will plan meals in advance, using primarily items already on hand from my pantry and freezer. The reason I only am planning a week at a time is because I like to incorporate sale items when possible, and I don't want to get too far ahead of myself, since baby #2 is on the way soon! Also, I've got apple fever here. We've been gifted LOTS of apples, so I'll be making 2-4 pies or crisps to eat and share with others and hopefully 2 more to freeze. And, we've been eating them as snacks every time we're hungry! Thanks, Amanda! I shouldn't need to buy much, since I bought milk and fruit over the weekend. I plan to purchase only the best deals this week using a limited budget. When going to choose meals for a meal plan, I look first in the freezer and pantry. Based on the meat and pantry items, I'll choose meals to make for that week. 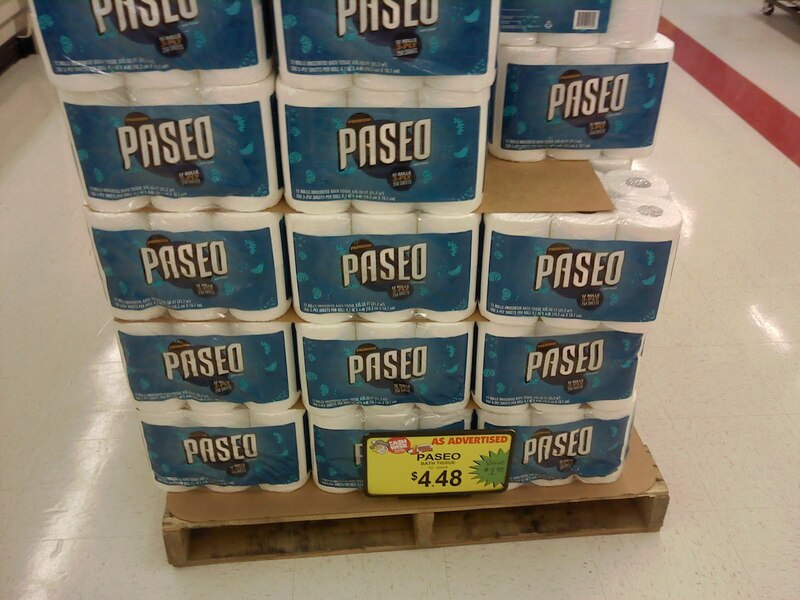 Often, the items on sale that week can be incorporated as well! Look at your family calendar to allow for nights you won't be eating at home so that you don't plan extra meals. Plus, I love this tip from the FM Cheapskate Facebook page: if you won't be home in time to prepare a meal, use your crock pot! Thanks, Adrianna! Use a printable meal planning page, like the one here from Money Saving Mom. Or, do an internet search to find one that works for you. Someday, I'd love to make this this magnetic menu planning board. It's so functional and cute! I think the easiest thing to do is over-complicate it. I'm really good at that. A sheet of paper with your 5-6 dinners written on it is all you need. Or, if you're a smart phone person, maybe there's an app for that. Who knows. Just give it a whirl and let us know how it goes! If you have tips for the rest of us, please share them! I enjoy meal-planning but am no expert. Anyone up for the challenge? 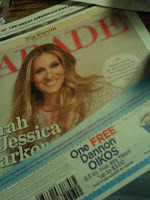 Look for a SmartSource and a Proctor and Gamble insert in your Sunday Star Tribune! Be sure to check that the inserts are in the paper before you buy it. As you all know, sometimes some (or all) of the inserts will be present in the Saturday Star. if you come across them in the FM area, let the rest of us know! For more on why I recommend buying the Star Tribune, read here. I found some great deals on my weekly late night shopping trip! Keep in mind I was shopping at Moorhead Cash Wise, so the same deals may not be available at other Cash Wise stores. 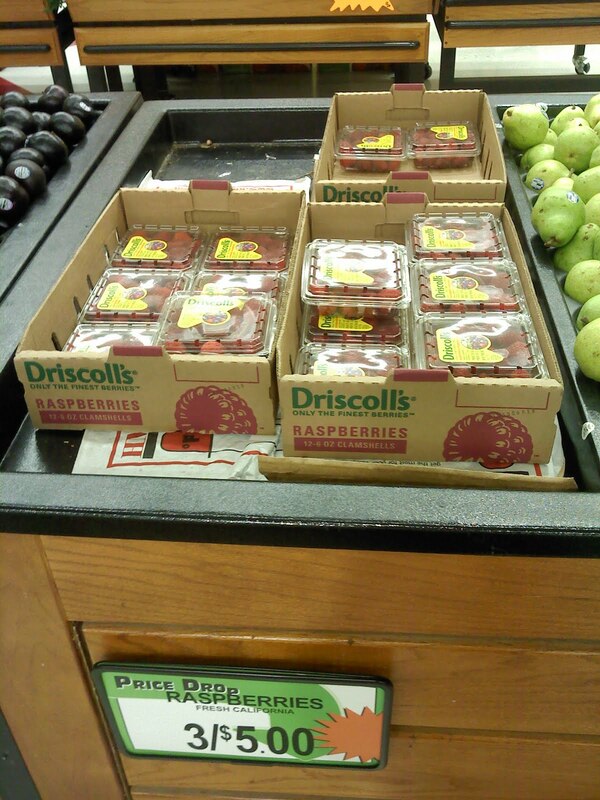 Driscoll Raspberries, half pint $1.67! Even better if you haven't signed up for your $0.50 printable yet! Final price: FREE (or the cost of your stamp)! 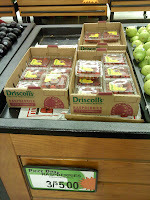 I've seen these at Hornbacher's and SunMarts as well, but not recently. Let us know if you have and which stores. The Kellogg's Corn Flakes that qualify for the weekly store deal and the $10 gas card rebate also have a Craisins sample and a $0.75 Craisins coupon on the box! Craisin coupons are pretty rare, so I was really excited to see those! 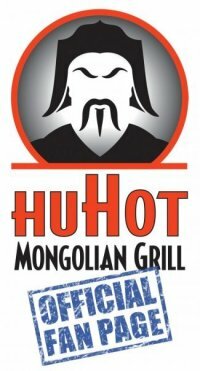 HuHot: $1/2 off Students + Kids Eat FREE Coupons! Love the HuHot Mongolian Grill? I do! It can be on the pricey side, though. Head over to the HuHot Facebook page, where you can find 2 awesome back to school coupons to use by 8/31! First, a Buy One, Get One 50% off (with a Student I.D. ), then a Kids (10 and under) Eat FREE coupon! I don't think these can be used together, but both are great deals. Coupons for the HuHot are rare! Want more restaurant deals? See them all here! FREE Activia Selects Yogurt Coupon by Email! 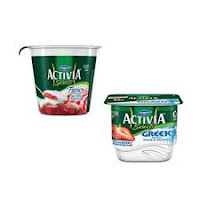 Sign up for Activia's email list and get a coupon for a FREE Activia Selects Greek or French Yogurt sent to your email. It will be a printable coupon. Don't forget, you can still request your FREE Dannon Oikos Greek Yogurt coupon by email as well! Fun and Free Around Town! 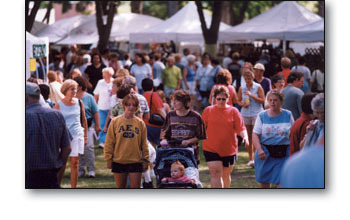 Starting today through September 5 is the Minnesota State Fair in St. Paul! 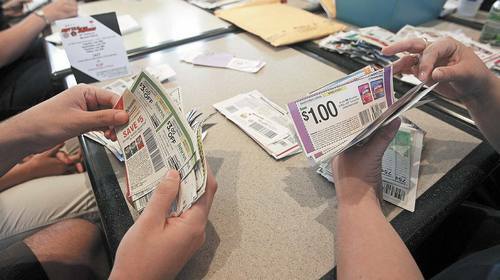 If you plan to attend, check out Creative Couponing's Minnesota State Fair Tips page! 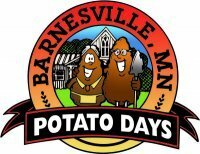 Friday and Saturday August 26-August 27 is the famed annual Potato Days in Barnesville! There are lots of FREE events as part of the festival...check the schedule of events for details. Saturday and Sunday from 10-5, head out to the Island Park Craft Show in Fargo! Sunday, turn off your engines and head out during Streets Alive! in Fargo and Moorhead! 3 miles of roads will be closed to engines and open to pedestrians, bikers, skaters and more! Runs from 12-5 on 8/28! More info on Streets Alive routes and activities here. And, last but not least... Don't forget about the Coupon Swap and Get Together on Saturday morning at West Acres! If you've been wanting to meet other couponers or are looking for more of certain coupons, come on out and bring any coupons you won't use to share with others! You're welcome with or without coupons to share. If you're looking for specific coupons, use the Coupon Trades Page. Half Off Gluten-Free items and more at Simply Savory! Another reason I love Save Coin deals! I hadn't even heard of Simply Savory before this morning! If you're looking for an all gluten free shop, this looks like a great deal to check out. Buy items already prepared or Simply Savory's Gluten Free Baking Mix! Get $20 to spend at Simply Savory for only $10! Plus, use up to 2 of these vouchers per visit! Today 8/25 only, head over to the Redbox Facebook page to request a code for a FREE rental! This code will be good today only, for a 1 night rental. Tutti Frutti: FREE Treat on Your Birthday! Head to Tutti Frutti in Fargo for a FREE 12 oz frozen yogurt treat on your birthday! Yummy! To see the rest of the birthday deals in our area, read more here! Thanks to Tutti Frutti on Facebook! 2 FREE Dannon Oikos Yogurt Coupons! 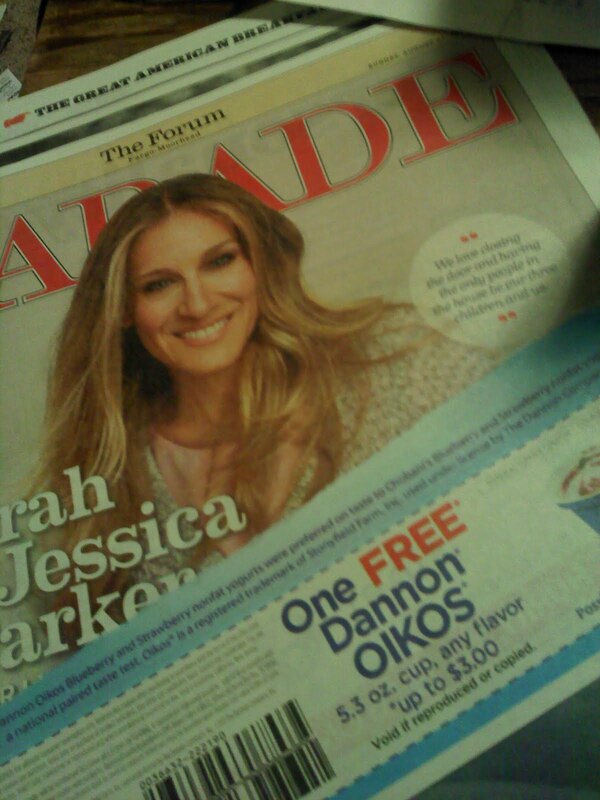 I just checked the Parade magazine in my 8/21 Fargo Forum (call me slow, it's ok...) and found this coupon for a FREE Dannon Oikos Yogurt! If you get the Forum, or know others that do, pull them out of your recycling bin! I didn't see this in the Parade that came in my Star Tribune. Did anyone else find one in other papers? Plus, you can request another FREE Dannon Oikos Coupon! This one will be emailed to you and is printable. Lots of stores should still take this coupon, though I know for sure that Cash Wise won't. 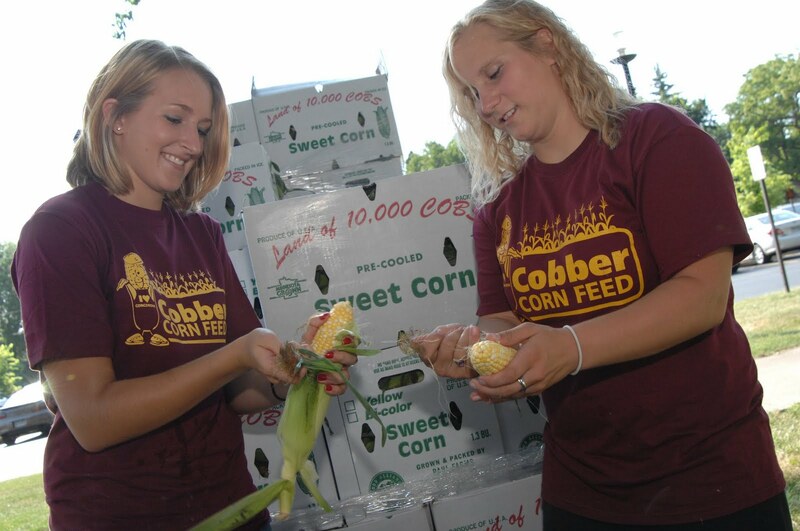 Concordia Cobber Corn Feed: FREE Corn Feed Tomorrow! Join the Concordia College community tomorrow night on Concordia's Moorhead campus for the annual Cobber Corn Feed! Event runs from 5:30-8, and all are welcome! Corn is provided, as much as you can eat! I live near Concordia, and I've seen the stacks of boxes of corn they're already shucking today! Feel free to bring a picnic dinner or purchase food from Concordia Dining Service concessions if you'd like anything besides corn on the cob! There will also be free inflatable games by Games Galore, a clown, barrel train and tons of Cobber spirit. I'm so excited about this! Eversave: FREE $10 Credit + Rue La La: Last Call for $10 Credit! I told you last week about the FREE $10 Credit available for signing up at Rue La La, and today is the LAST day to claim it! All you need to do is sign up with this link and watch for your $10 to be added to your account! Credit expires 9/18. Today, Eversave is getting in on the action! If you're already an Eversave member, check your account for your $10 credit! If you're not, use this link to sign up and your $10 credit will be added to your account! You'll have to act fast, since this credit is only available through 8/25 and expires the same day! 2 Boxes Creamette Pasta, 12-16 oz FREE with $30 purchase and Cash Wise in store coupon! Then stack additional manufacturer's coupons for more savings! Final price: as low as $0.30 each! 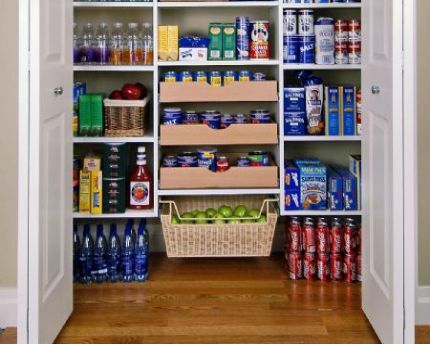 Final price: as low as $0.40 per item after coupons! 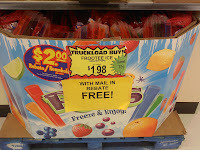 Plus, if you buy 2 Corn Flakes save $1.50 on Fresh Fruit with the coupon from the Kellogg's New School Year Coupon Book! 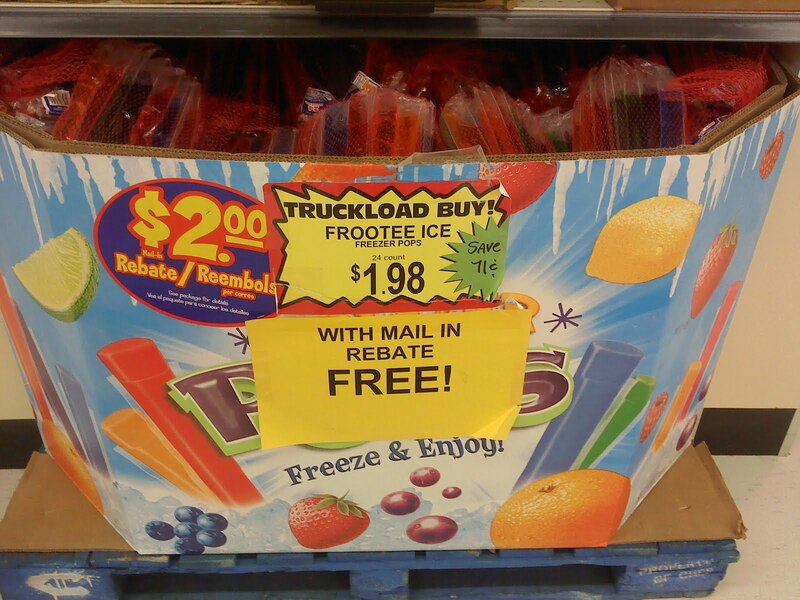 Plus, look for boxes to purchase that qualify for the Kellogg's rebates that are available! Food Club Chewy Bars, 8.4 oz Chocolate Chip or Variety Pack $1.44 (through 8/27)! Kellogg's Rebates + HOT Deals at Cash Wise! There are several great ways to get a deal on Kellogg's Cereals this week at Cash Wise! We have a Cash Wise coupon, Manufacturer's coupons and rebate offers to take advantage of! So, remember you can use 1 manufacturer's coupon and 1 store coupon per item. But, the deal gets better when you combine with a rebate or two! Look for boxes marked with Cars Points. Specially marked particpating Kellogg's cereals have a 16 digit code inside that you'll enter online and redeem for goodies. My favorite would have to be the $5 gas cash gift card, for only 4 points! 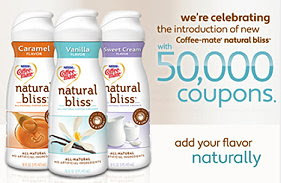 Enter and redeem 30 points maximum for this promotion through 6/30/12. Thanks, Beth! Secondly, buy particpiating Kellogg's cereals that qualify for a $10 gas cash gift card when you buy 10! The 10 don't have to be purchased all together. I'm not sure if you can overlap these 2 rebates, as one requires you to mail in UPC's and the other only requires you to enter codes online from the boxes. You can mail in 5 of these $10 gas card rebates per household by 12/31/2011! Let us know what fabulous deals you're able to snag with this great combo of promotions this week! General Mills Cereals (Cinnamon Burst Cheerios 10 oz, Cinnamon Toast Crunch 12.8 oz, Cookie Crisp 11.25 oz, Fruity Cheerios 12 oz, Golden Grahams 12 oz, Honey Nut Cheerios 12.5 oz, Oatmeal Crisp Flakes 17-18 oz) - Buy 6, save $10 with in ad SunMart coupon! Plus, get a coupon at checkout for $3.25 off milk and $1.75 off eggs on your next order! Final price: $1.67 off each cereal with the in-ad coupon, plus any savings from manufacturer's coupons. Plus, get the $5 worth of coupons at checkout! If you have the regular prices for these cereals, let me know and I'll update this with an actual final price! Plus, use the $2 off Pork Ribs when you buy KC Masterpiece printable if you buy ribs as well! 80% Lean Ground Beef $1.99/lb (sold in 10 lb packs)! Normally I think we see the half pint for this price! I'd save this coupon for a better sale, but if you need peanut butter it's a good price! Final price: $1.50 if you can find them! If your kids could use a haircut before school begins, get out today and take advantage of Josef's School of Hair Design's Cuts for Kids! Josef's and the Salvation Army have partnered to bring FREE haircuts to kids entering grades K-12 just before school starts! The event is from 12:30 to 6 p.m. Monday at Josef’s School of Hair Design, 627 NP Ave. N. in Fargo. Clients will be served on a first-come, first served basis. Metro Area Transit is supporting the event by providing free bus transportation to and from the event for riders who present the Cuts for Kids flier as they board the bus. I'm not sure where the flier was available, but if you're able and could use the haircut for your kids, get out and take advantage today! Tours of the Fargo Main Fire Station will be available while guests are waiting for their haircut. Save Coin: $10 for $20 to Spend at Wing Zone! Through tonight only, head to Save Coin, where you can score a $20 voucher to use at Wing Zone in West Fargo for only $10! You can purchase as many as you'll use, but can only use one $20 voucher per visit. These are even valid on delivery! Vouchers won't expires til 4/30/12! Head over to Save Coin to snag yours! NDSU Welcome Back Luau Tonight: FREE Food! All NDSU students are invited to join the Residence Hall Association Luau tonight from 8-11 PM! The Welcome Back Luau will be held on the west side of Pavek and Seim Halls. The party sounds like a good time with a mechanical surfboard, a steel drum band and salsa dancing, but probably most important to all you college students: FREE food! Join me this coming Saturday 8/27 from 10-Noon for another Get Together + Coupon Swap! We will meet in the Food Court at the West Acres Mall in Fargo from 10 AM-Noon. Look for the group of us wielding scissors and inserts! Feel free to grab a coffee, snack or just join us with your coupons. If you have coupons to share, bring them clipped if possible and we'll just send envelopes around. If you don't have coupons to share, but are looking for some extras, there are PLENTY to go around! Please join us anyway! Anyone is welcome! Feel free to come just to meet other local couponers or ask questions! See you there! Look for just a SmartSource in your Sunday Star Tribune! Be sure to check that the inserts are in the paper before you buy it. I see LOTS of exciting coupons this week! $0.25 off any Heinz Ketchup! $0.55 off any Country Hearth Bread! United Way School Supply Drive: Backpack Pick Up Tonight! 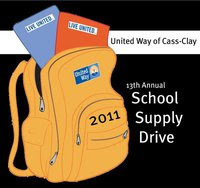 For the last several weeks, the United Way of Cass Clay has been holding a School Supply Drive. Tonight, from 4-8 if you are in need of school supplies you may pick up a backpack at either Concordia College's Memorial Auditorium or at the West Fargo Veteran's Arena. If you are planning on picking up a backpack for your student, bring this form to either location tonight! Save Coin: $65 for a 2 Hour Home Deep Cleaning! I have to hand it to the guys over at Save Coin. I've been asking for this deal since I knew we would be expecting a baby early this fall. A sincere thank you to whoever made it happen! You know I am a cheapskate. You know I am frugal and try not to spend money frivolously. You may not know that cleaning and I don't always meet eye to eye. I clean. Not as often as I think I should, but I can wipe a sink and vacuum a floor. But deep cleaning and being 8 months pregnant do not go together in my book. I am beyond thrilled that for a mere $65 I will be able to scratch "Deep Clean the House" off my "Before Baby Arrives" list. Anyhoo, today's deal is $65 for a 2 Hour 2 Person Deep Clean of your Home! The green cleaners, FM Peachy Clean are local moms who get it. They also offer lots of other cleaning services. It's a $150 value, but to me it's priceless. Limit 1 per household, but you may purchase one more as a gift. (Know anyone expecting a baby? Going though a tough family or medical situation? What a blessing this gift would be!) There are only 200 available, so act quickly if you plan to purchase one! Rue La La: FREE $10 Credit for Joining! Rue La La is offering a $10 credit to new members just for signing up with this link! Rue La La is a deal site that offers new deals each day for a limited period of time, but you'll find great discounts! A FREE $10 should easily score you a FREE item, maybe even cover part of shipping costs! The credit is only available for new sign-ups through 8/23, so hurry to request your $10 credit today! Credit will appear in your account within 48 hours and will expire if not used by 9/18/11. I'm headed to SunMart today to scope out some more deals, so stay tuned! Locally Grown Sweet Corn $0.25 each! Pizza for a Purpose: Lunch Today! 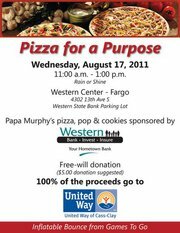 If you're looking for something to do for lunch today, join the United Way of Cass Clay and Western Bank from 11-1 today at the Western State Bank parking lot (near 13th Ave Target) for Pizza for a Purpose! Lunch will include Papa Murphy's pizza, pop and cookies. For the little ones, there will be inflatable games! Lunch is yours for a free-will donation ($5 suggested) and all proceeds benefit the United Way of Cass Clay! Save Coin: $30 for a 1 Hour Massage! Hurry to snag this one if you're interested, massage deals tend to sell out quickly! 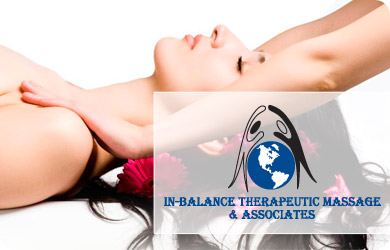 Today over at Save Coin, get a 1 Hour Massage at In Balance Therapeutic Massage for only $30! This is a $60 value! You can buy up to 2 per person, use 1 per visit and you have til 2/17/12 to use it! You have a limited time to purchase a voucher, but in exchange you'll get a great discount! In this case, a 50% discount if you buy today while supplies last! Once you purchase the voucher, you'll receive an email or you can log in to Save Coin to print your voucher. To redeem it, simply present the voucher like a coupon to the merchant. In this case you have til 2/17/12 til your voucher expires! 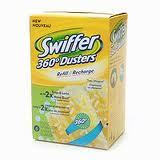 If you're a Vocalpoint member, log in to request your FREE Swiffer Duster! I'm sure this sample won't last long, so hurry to request yours! HOT! $10 CVS Gift Card for $6! Saveology is offering a HOT deal for new customers only today! 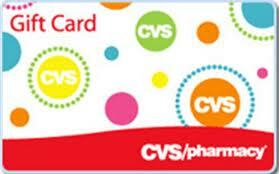 While supplies last, get a $10 CVS Gift Card for only $6! Limit 1 per household. Gift card will be mailed to you. Hurry to snag this deal if you're interested! Tonight is the 2011 Bison Fan Night on the turf at the Fargodome! This FREE event from 6:30-8:30 tonight August 16th is open to the public. Fans will have the opportunity to meet and greet this year's Bison football, volleyball and soccer players and coaches. There will be inflatable games from Games Galore, an interactive zone, along with free NDSU posters, prizes, schedule cards and more! First 1,000 fans will receive a FREE yard sign! Thanks, North Dakota State University! 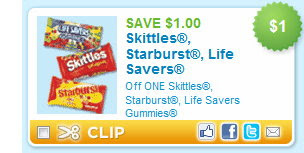 New Printable Coupons: Earthbound Farm, Skittles and More! Interesting combination of coupons available this morning! First, an exciting new organic coupon, which I always appreciate finding! Head over to the Earthbound Farm website to take a 12 question quiz to print a $1 off any Earthbound Farms product coupon! If you need some pointers, read over the Organic 101 article on the page first! Then, a super high value $1 off Skittles, Starburst or Lifesavers Gummies 13-16 oz printable! Then, head to the Ocean Spray Facebook page to print a $1 off Ocean Spray Sparkling Juices (4 pack) coupon! Lastly, print a $1 Girards Dressing coupon. These don't go on sale often, but I do see them in the SunMart reduced bins often! 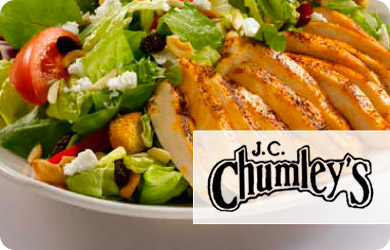 Save Coin: $10 for $20 to Spend at Chumley's Bar and Grill! Today's Save Coin deal is $10 for $20 to spend at Chumley's Bar and Grill in Moorhead! Buy up to 2 per person, and receive credit back if you don't use the full $20 in one visit! To see specials and the menu, head to Chumley's website! Food Club Apple Juice Cocktails, 64 oz FREE with $30 purchase and Cash Wise in store coupon! Final price: $3.98, only $1.99 each! Final price: as low as $0.44! Final price: as low as $0.93 each! Final price: as low as $0.84 each!